Futsal is played between two teams of five players each, one of whom is the goalkeeper. Unlimited substitutions are permitted. Unlike some other forms of indoor football, the game is played on a hard court surface delimited by lines; walls or boards are not used. Futsal is also played with a smaller, harder, low-bounce ball. The surface, ball, and rules together favour ball control and passing in small spaces. The game's "emphasis is on improvisation, creativity and technique." Futsal comes from Spanish fútbol sala or fútbol de salón and from Portuguese futebol de salão. The term is commonly translated as "indoor football", but a more literal translation is "hall/lounge football". During the sport's second world championships held in Madrid in 1985, the Spanish name fútbol sala was used. Since then, all other names have been officially and internationally changed to futsal. The naming was due to a dispute between FIFUSA (the predecessor to the AMF) and FIFA over the name of fútbol, FIFUSA has registered the word fut-sal in 1985 (Madrid, Spain). Since then FIFA has also started using the term futsal. The name has been translated into Italian as calcio a 5 (literally 5-a-side football) or football sala and French as football de salle. "Futsal" started in 1930 when Juan Carlos Ceriani [fr], a teacher in Montevideo, Uruguay, created a version of indoor football for recreation in YMCAs. This new sport was originally developed for playing on basketball courts, and a rule book was published in September 1933. Football was already highly popular in the country and after Uruguay won the 1930 World Cup and gold medals in the 1924 and 1928 Summer Olympics, it attracted even more practitioners. Ceriani's goal was to create a team game that could be played indoor or outdoor but that was similar to football. Ceriani, writing the rule book, took as examples the principles of football (the possibility to touch the ball with every part of the body except for the hands), and he took rules from other sports too: from basketball the number of team players (five) and the game duration (40 actual minutes); from water polo the rules about the goalkeeper; from team handball for the field and goal sizes. The YMCA spread the game immediately throughout South America. It was easily played by everyone, everywhere, and in any weather condition, without any difficulty, helping players to stay in shape all year round. These reasons convinced João Lotufo, a Brazilian, to bring this game to his country and adapt it to the needs of physical education. Initially, the rules were not uniform. In 1956, the rules were modified by Habib Maphuz and Luiz Gonzaga de Oliveira Fernandes within the YMCA of São Paulo, Brazil to allow seniors to compete. Luiz de Oliveira wrote the Book of Rules of Fuitsal in 1956, then adopted also at the international level. 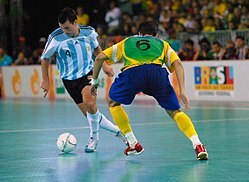 In 1965, the Confederación Sudamericana de Fútbol de Salón [pt] (South American Futsal Confederation) was formed, consisting of Uruguay, Paraguay, Peru, Argentina and Brazil. The sport began to spread across South America, and its popularity ensured the formation of a governing body in São Paulo in 1971, under the name of Federación Internacional de Fútbol de Salón (FIFUSA). FIFUSA initially comprised Argentina, Bolivia, Brazil, Paraguay, Peru, Portugal, and Uruguay, along with the World Championships. The new institution counted 32 participating countries and its first President was João Havelange joined by the secretary Luiz Gonzaga de Oliveira. In 1975, the Federation's chief passed to FIFA, and in 1980, Januário D'Alessio Neto was elected to work to make this sport recognized worldwide by supranational bodies. In 1985, Joseph Blatter, at that time secretary of football's governing body, FIFA, thought it was the right time to enlarge its influence and therefore also deal with indoor football. Knowing that the Federation President João Havelange was the head of FIFUSA from 1971 to 1974, the Swiss decided to summon in Brazil the world governing body of futsal: Surprisingly, the Congress voted against the unification. Due to a dispute between FIFA and FIFUSA over the name of fútbol, FIFUSA has registered the word fut-sal in 1985 (Madrid, Spain). FIFA wanted to promote and spread its own version of indoor football, different from the original one played in the South American countries, but they could not manage to come to an agreement with FIFUSA in the Rio de Janeiro Congress in 1989. On 2 May 1990, the Brazilian federation finally broke away from FIFUSA, and on 25 September, an event in Bogotá, Colombia contributed to the founding of the Confederación Panamericana de Futbol de Salon (PANAFUTSAL) together with Paraguay, Colombia, Mexico, Uruguay, Argentina, Venezuela, Costa Rica, Puerto Rico, Bolivia, Ecuador, the Netherlands Antilles, Aruba, and Canada. 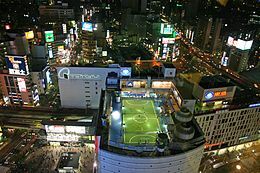 The conference held in Guatemala in 2000 between members of PANAFUTSAL and FIFA focused on the resolution of the dispute between the two institutions and on the achievement of futsal in the pure version that excited many in South America. The signing of the Protocol, however, was not followed by concrete actions. FIFA kept on promoting its version of futsal. So the PANAFUTSAL decided to create a new worldwide body for the preservation of futsal. In December 2002, the Asociación Mundial de Futsal (AMF) was founded. It is currently composed of 40 national federations and three continental bodies, one of which was FIFS. Futsal currently has two governing bodies: Asociación Mundial de Fútsal (AMF) and Fédération Internationale de Football Association (FIFA). AMF is the successor organization to the original governing body. FIFA later took an interest in futsal. However, talks between FIFA and AMF to reconcile governance were not successful. FIFA organizes its own separate competitions. There are currently two governing bodies: Asociación Mundial de Fútsal (AMF) and Fédération Internationale de Football Association (FIFA). AMF and FIFA are responsible for maintaining and regulating the official rules of their respective versions of futsal. minimum 25 m × 16 m (82 ft × 52 ft), maximum 42 m × 25 m (138 ft × 82 ft). Size 4, circumference 62–64 cm (24–25 in), weight between 400–440 g (14–16 oz) at the start of the game. Dropped from a height of 2 m (6 ft 7 in), the first rebound must not be lower than 50 cm (20 in) or more than 65 cm (26 in). There are two periods of 20 minutes with time stopping at every dead ball. Between the two periods there is a break of 15 minutes. Each team may use one time-out per half, which lasts one minute. Some lower leagues and tournaments use 24 minute periods with running time. There are five players for each team in the field, one of them as goalkeeper, and a maximum number of 12 players that can be used each match. Substitutions are unlimited and on-the-fly. All direct free kicks count as accumulated fouls. A direct free kick is awarded for kicking, tripping, charging, jumping, pushing, striking, tackling, holding, spitting, and deliberate handling. Indirect free kicks, such as playing dangerously and impeding, do not count as accumulated fouls. A team is warned by the referee when they commit five accumulated fouls in a half. A caution can be shown for unsporting behavior, dissent, failure to respect the distance on a restart, excessive delay of a restart, persistent infringement, or incorrectly entering/leaving the field of play . A player or substitute can be sent off for serious foul play, violent conduct, spitting, illegally denying an obvious goal-scoring opportunity, abusive language, and receiving a second caution. Sent-off players are ejected from the game and their team must play short for two minutes or until the other team scores a goal. Taken from the spot of the infringement or on the line of the penalty area nearest the infringement (indirect only). All opponents must be at least 5 m (16 ft) away from the ball. The kick must be taken within four seconds or an indirect kick is awarded to the other team. Awarded when a team commits 6 or more accumulated fouls in a half. Second penalty mark is 10 m (33 ft) from the goal, opponents must be behind the ball, goalkeeper must be at least 5 m (16 ft) away. 6 m (20 ft) from the center of the goal for fouls inside the 6 m (20 ft) goal keeper's area. When in possession of the ball, the goalkeeper has 4 seconds to get rid of the ball. If the ball is kept too long, the referee will give an indirect kick to the other team. The goalkeeper may play freely when in the opponent's half. Once the goalkeeper has released the ball either by kicking or throwing, the goalkeeper may not touch it again until the ball goes out of play or is touched by an opponent. The sanction for violation is an indirect free kick. The goalkeeper may receive the ball freely when on the opponent's half. A kick-in is used instead of a throw-in. The player must place the ball on the touchline or outside but not more than 25 cm (9.8 in) from the place the ball when out of play. The ball must be stationary and the kick-in must be taken within 4 seconds from the time the player is ready. During kick-in, opponents must stand at least 5 m (16 ft) from the ball. If four seconds elapses or an illegal kick is taken, the referee will award a kick-in to the other team. It is not allowed to score directly from a kick-in: the goal is valid only if someone else touches the ball before it enters in goal. A goal clearance is used instead of a goal kick. The goalkeeper must throw the ball with their hands and it must leave the penalty area within four seconds. If goal clearance is taken illegally the goalkeeper may retry, but the referee will not reset the count. If four seconds elapses, the other team gets an indirect kick on the penalty area line. The ball must be placed inside the arc nearest to the point where the ball crossed the goal line and the opponent must stand on field at least 5 m (16 ft) from the corner arch until the ball is in play. The corner kick must be taken within 4 seconds of being ready or else a goal clearance will be awarded to the other team. The ball is in play when it is kicked and moves. For international matches, there must be two referees: one (first referee) is positioned on the touchline near the timekeeper table and communicates with the timekeeper, while the other (second referee) is in the opposite side of the field. At the timekeeper table there is a timekeeper and a third referee, who controls the teams' benches. In minor events, the third referees and the timekeeper are not used. The kit is made up of a jersey or shirt with sleeves, shorts, socks, shinguards made out of metal, plastic or foam, and shoes with rubber soles. The goalkeeper is allowed to wear long trousers and a different coloured kit to distinguish themself from the other players on the team and the referee. The goalkeeper is also allowed to wear elbow pads because the surface is about as hard as a tennis court or basketball court. Jewellery is not allowed, nor are other items that could be dangerous to the player wearing the item or to other active participants. The match is controlled by the referee, who enforces the Laws of the Game, and the first referee is the only one who can legally abandon the match because of interference from outside the field. This referee is assisted by a second referee who typically watches over the goal lines or assists the primary referee with calls on fouls or plays. The decisions made by the referees are final and can only be changed if the referees think it is necessary and play has not restarted. There is also a third referee and a timekeeper who are provided with equipment to keep a record of fouls in the match. In the event of injury to the second referee, the third referee will replace the second referee. The field is made up of wood or artificial material, or similar surface, although any flat, smooth and non-abrasive material may be used. The length of the field is in the range of 38–42 m (125–138 ft), and the width is in the range of 20–25 m (66–82 ft) in international matches. For other matches, it can be 25–42 m (82–138 ft) in length, while the width can be 16–25 m (52–82 ft), as long as the length of the longer boundary lines (touchlines) are greater than the shorter boundaries where the goals are placed (goal lines) (Basketball fields of 28 m × 15 m (92 ft × 49 ft) can be used). The "standard" size court for an international is 40 m × 20 m (131 ft × 66 ft) (the size of a handball field). The ceiling must be at least 4 m (13 ft) high. A rectangular goal is positioned at the middle of each goal line. The inner edges of the vertical goal posts must be 3 m (9.8 ft) apart, and the lower edge of the horizontal crossbar supported by the goal posts must be 2 m (6.6 ft) above the ground. Nets made of hemp, jute or nylon are attached to the back of the goalposts and crossbar. The lower part of the nets is attached to curved tubing or another suitable means of support. The depth of the goal is 80 cm (31 in) at the top and 1 m (3.3 ft) at the bottom. In front of each goal is an area known as the penalty area. This area is created by drawing quarter-circles with a 6 m (20 ft) radius from the goal line, centered on the goalposts. The upper part of each quarter-circle is then joined by a 3.16 m (10.4 ft) line running parallel to the goal line between the goalposts. The line marking the edge of the penalty area is known as the penalty area line. The penalty area marks where the goalkeeper is allowed to touch the ball with hands. The penalty mark is six metres from the goal line when it reaches the middle of the goalposts. The second penalty mark is 10 metres (33 ft) from the goal line when it reaches the middle of the goalposts. A penalty kick from the penalty spot is awarded if a player commits a foul inside the penalty area. The second penalty spot is used if a player commits their team's sixth foul in the opposing team's half or in their own half in the area bordered by the halfway line and an imaginary line parallel to the halfway line passing through the second penalty mark; the free kick is taken from the second penalty mark. In some competitions, the game cannot end in a draw, so away goals, extra time and kicks from the penalty mark are the three methods for determining the winner after a match has been drawn. Away goals mean that if the team's score is level after playing one home and one away game, the team which has scored more away goals wins. Extra time consists of two periods of five minutes. If no winner is produced after these methods, three kicks from the penalty mark are taken, and the team that has scored the most wins. If it is not decided after three kicks from the penalty mark, it continues to go on with one extra kick from the penalty mark to each team at a time until one of them has scored more goals than the other. Unlike extra time, the goals scored in a shoot-out do not count towards the goals scored throughout the match. At the beginning of the match, a coin toss is used to decide who will start the match. A kick-off is used to signal the start of play and is used at the start of the second half and any periods of extra time. It is also used after a goal has been scored, with the other team starting the play. After a temporary stoppage for any reason not mentioned in the Laws of the Game, the referee will drop the ball where the play was stopped, provided that, before the stoppage, the ball was in play and had not crossed either the touch lines or goal lines. An indirect free kick is also awarded to the opposing team if a player plays in a dangerous manner, deliberately obstructs an opponent, prevents the goalkeeper from throwing the ball with hands or anything else for which play is stopped to caution or dismiss a player. The indirect free kick is taken from the place where the infringement occurred. Yellow and red cards are used in futsal. The yellow card is to caution players over their actions. If they get two, they are given a red card, which means they are sent off the field. A yellow card is shown if a player shows unsporting behaviour, dissent, persistent infringement of the Laws of the Game, delaying the restart of play, failing to respect the distance of the player from the ball when play is being restarted, infringement of substitution procedure or entering, re-entering and leaving the field without the referee's permission. A player is shown the red card and sent off if they engage in serious foul play, violent conduct, spitting at another person, or denying the opposing team a goal by handling the ball (except the goalkeeper inside their penalty area). Also punishable with a red card is denying an opponent moving towards the player's goal a goalscoring opportunity by committing an offence punishable by a free kick or a penalty kick and using offensive, insulting or abusive language or gestures. A player who has been sent off must leave the vicinity of the field. A substitute player is permitted to come on two minutes after a teammate has been sent off, unless a goal is scored before the end of the two minutes. If a team with more players scores against a team with fewer players, another player can be added to the team with an inferior number of players. If the teams are equal when the goal is scored or if the team with fewer players scores, both teams remain with the same number of players. ^ "World Cup 2014: Futsal – the game behind Brazil's superstars". BBC. 2 July 2014. ^ "New to Futsal". 2C Futsal. Retrieved 2018-03-01. ^ Administrator. "History of Futsal". futsal.com. ^ "Futsal Planet News – World Futsal Association is formed". Futsal Planet. Retrieved 2008-01-31. ^ "Futsal World Ranking". Futsalworldranking.be. Retrieved 10 February 2019. ^ a b c d e f "UEFS History". Archived from the original on 14 July 2010. Retrieved 18 July 2010.